I am so happy to finish this in time for Christmas! It is my best fitting project so far. See how happy I am? Happy happy happy. I'm happy that I don't look like a fattened Christmas Goose in this picture. THAT, my friends, is something to be happy about. Here's the deets. 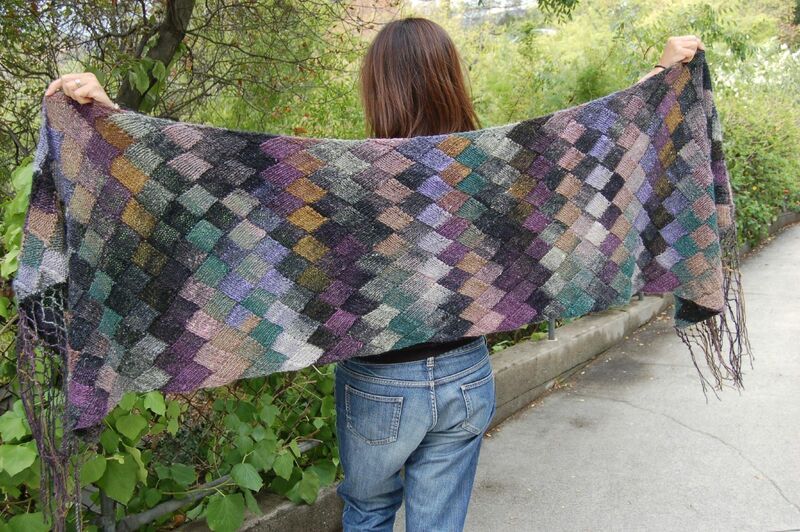 *edit* Forgot to tell you the pattern! 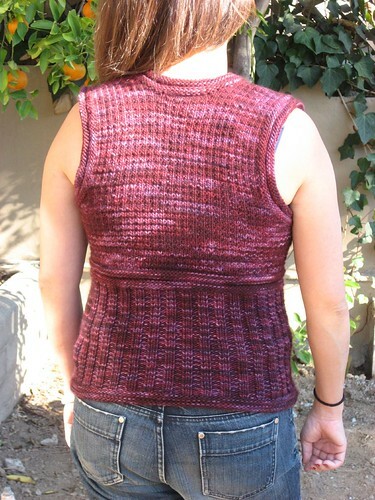 **doh** This is the Back to school u-neck vest from Stephanie Japel's Fitted Knits. I love this book and I've knit 6 projects from it. 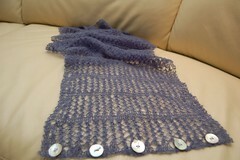 Yarn is Malabrigo worsted in Velvet Grapes. 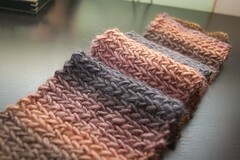 I used most of 3 skeins on size 7 Addi turbos. 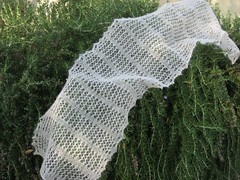 I cast on 11/19, but got way side tracked but gift knitting. I guesstimate maybe 1.5 week project? I knit for 37" bust and I am a 40" bust. Love that negative ease. See the tangerine tree in the background? Yeah, I live in So Cal. 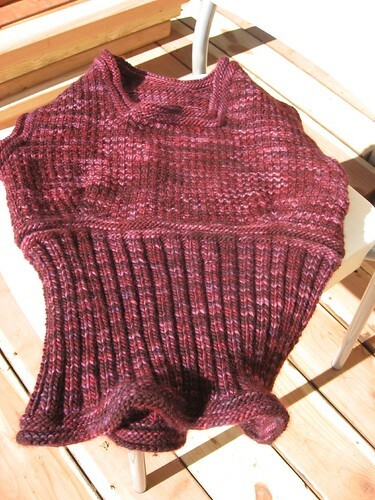 I'm guessing that a vest is the maximum amount of coverage I can stand from Malabrigo. That is some warm and yummy stuff! I had planned to make the Textured Tunic from Fitted knits in an insanely beautiful yellow/orange color way of Malabrigo, but I think this vest might dissuade me from that plan. 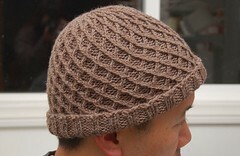 I'd hate to knit something I can only wear twice a year. 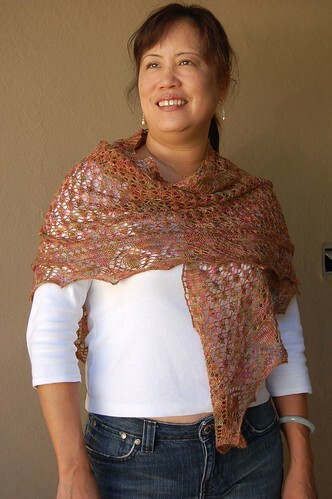 I made some mistakes along the way, but the Malabrigo did a great job of covering them up. I love that I am getting knowledgeable enough to know what is a fatal mistake that must be ripped from a mistake that can either be fixed, fudged or ignored. On this project I did much of all three! The awesome thing is that even I can't tell where these things happened. Doesn't the garment look funny all by itself? It looks like a purple sausage casing just waiting to be stuffed. Oiy! And I was just beginning to feel skinny!! !